Before I start, I have to say that I absolutely love love love this community of teachers. It's been so fun meeting you all (and through the Internet still counts as meeting... kind of). 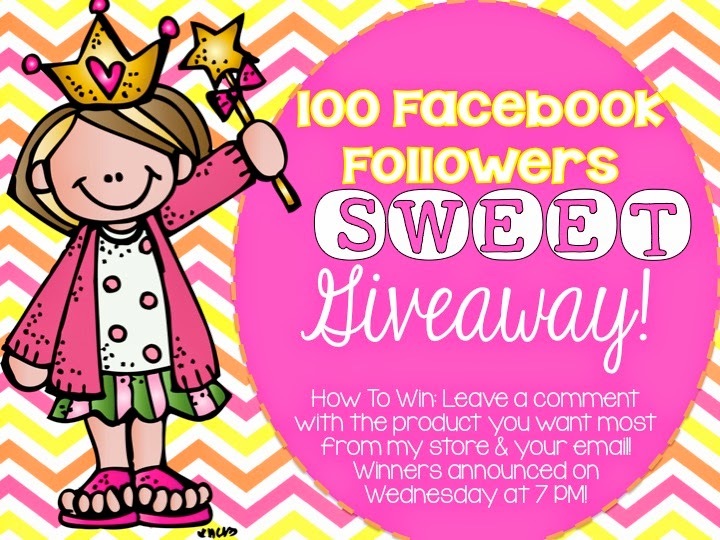 I've reached 100 followers on Facebook, so I'm having a giveaway to celebrate. Thank you to those of you that follow! If you don't and you're interested in the giveaway, just click here. Just like my Facebook page, find a product in my store here that you would love to own, and comment on Facebook with the name of the product and your email. Easy peasy lemon squeezy. 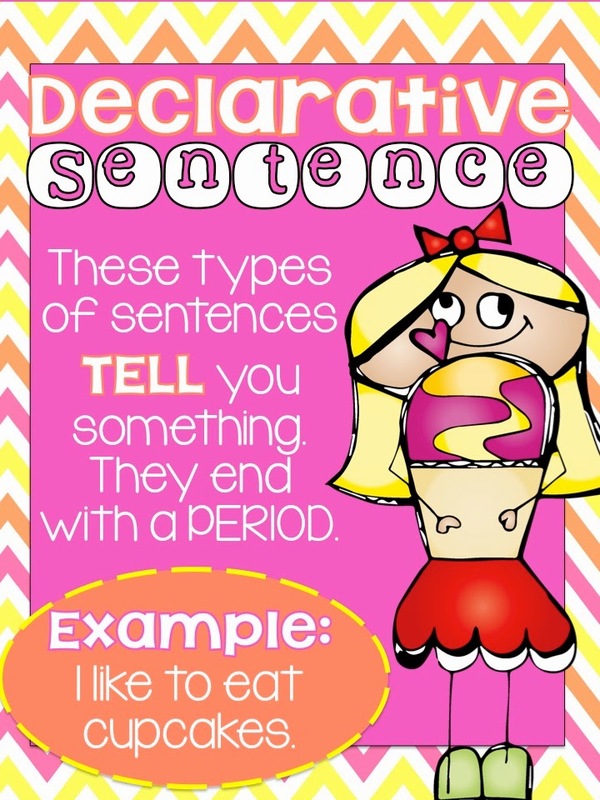 As I mentioned this weekend, defining and identifying the four types of sentences (Declarative, Exclamatory, Imperative, and Interrogative) is in our curriculum. When I first heard last year that it would be in the first grade curriculum, my eyes got real big and I lost my breath for a quick second. Let's be real here and say, if you would've asked me a year ago what the four types of sentences are, I wouldn't have been able to tell you. I know what you're thinking, "And this girl is a teacher?" Anyway, let me walk you through how we have begun learning these concepts in Room 9 this week. We started with these anchor charts. Just click on it to see a closer view. The kids loved these. 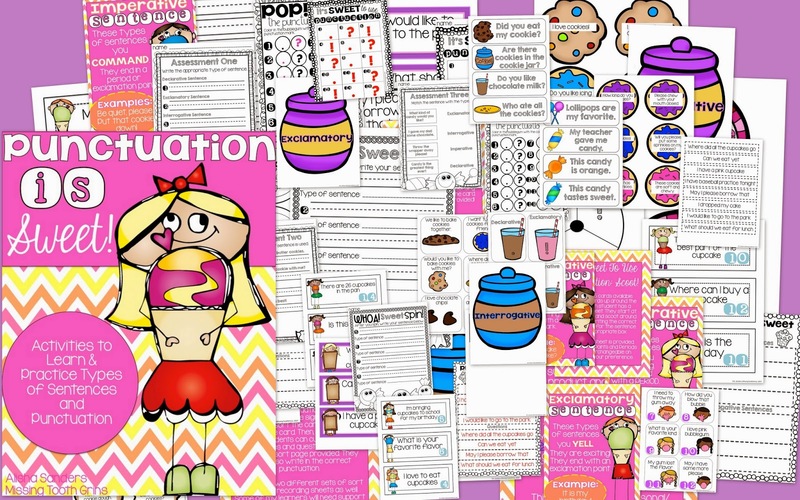 Our classroom is a sweets theme and so it all fits perfectly. I read to them the different types of sentences, they read the examples, and also came up with their own examples. They were very interested in who drew and colored these cookie jars. We went through the chart and the different types of sentences again. Then, I passed each of them one cookie. Not real cookies, although I wish they were real because I love me some cookies. Some friends had two cookies because I only have 16 kids in my room and I had 24 cookies. I know those of you with over 25 kids in your class are scolding me through your computer screen because I have such a little amount of kids. It's the perfect size, I must say. Each of my firsties tried so hard to say the correct word. Interrogative won as the most difficult type of sentence to say. They would say, "Inter... umm... Inter...gggggg." Cracked me right up, but they really tried their hardest. They're such good sports. Thank goodness lunch was next because boy oh boy, we were hungry. There's also some center activities that we have been doing to go along with our sentence and punctuation fun. This is the same as the whole group activity, but with cookies and milk. It is in one of my Daily 5 areas. Pop! The Punctuation has been a pretty big hit too. My dear friends love Scoot too. There's just one more activity that we didn't get the opportunity to do yet. I didn't make it to the laminator in time this morning. So, hopefully tomorrow! Here's the pack if you are wanting to check it out. Just click on the picture and it'll take you to my store. You could win this if you enter the giveaway :) Just sayin'! Have a good rest of your week! Alisha CONGRATS on the big 100 followers! So excited for you! 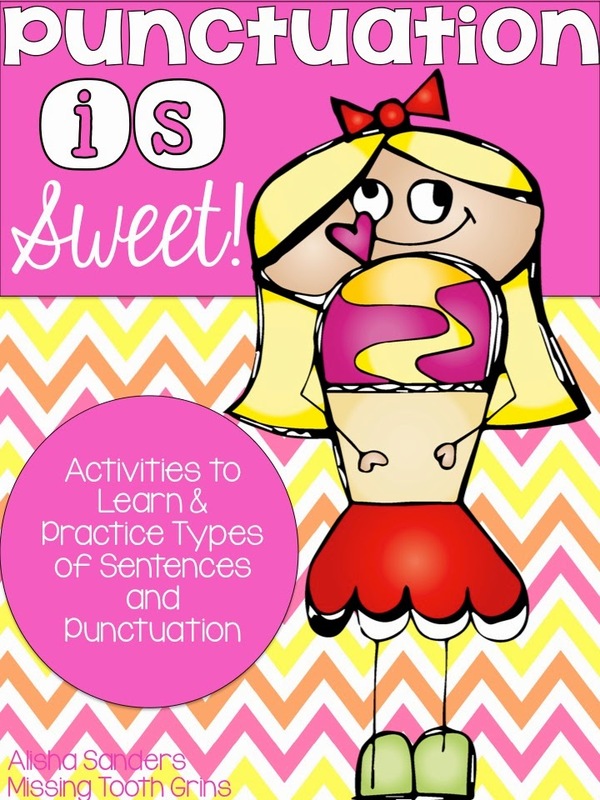 It was a great article on Types of Sentences. I thoroughly enjoyed reading all your articles.